THINKING ABOUT A DIFFERENT WAY TO STYLE A TIERED TRAY? One of the best things to style a tiered tray is that it is not only easy but budget friendly. You never have to spend a lot of money to obtain a stylish decor look. Careful planning can lead to styling tiered trays for fabulous home decor. So, should you use a two or three tiered stand? Honestly, you can keep both a two and three tiered stand. Use the tiered stand that is needed for the particular event or celebration you are celebrating. Think about the result you are interested in. Is it a seasonal look with Spring, Summer, Fall or Winter theme? Is it to celebrate a holiday such as the 4th of July, Easter, Halloween, or Christmas. Maybe the result you are looking for is a Birthday celebration or Baby Shower. 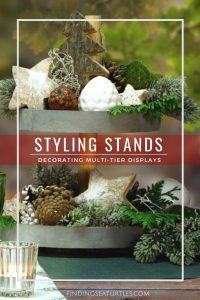 Farmhouse tiered stands can help you create a festive celebration for whatever event you need to observe. Style a tiered tray for every season of the year. Gather your seasonal items to get the look you are interested in. Once you have your seasonal items, it is quick and easy to update your tiered tray. 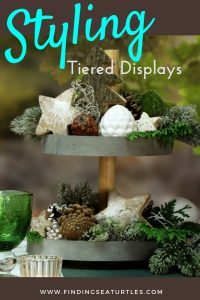 Take a look at these tiered trays for Fall and Winter displays. Be sure to let us know what you think. The Sander-Tischwaesche two tired antiqued stand displays beautiful white pumpkins and gourds. Add fresh artichokes as a contrast to the white pumpkins. Tuck in some greenery to fill in any exposed gaps between the pumpkins, gourds, and artichokes in the stand. 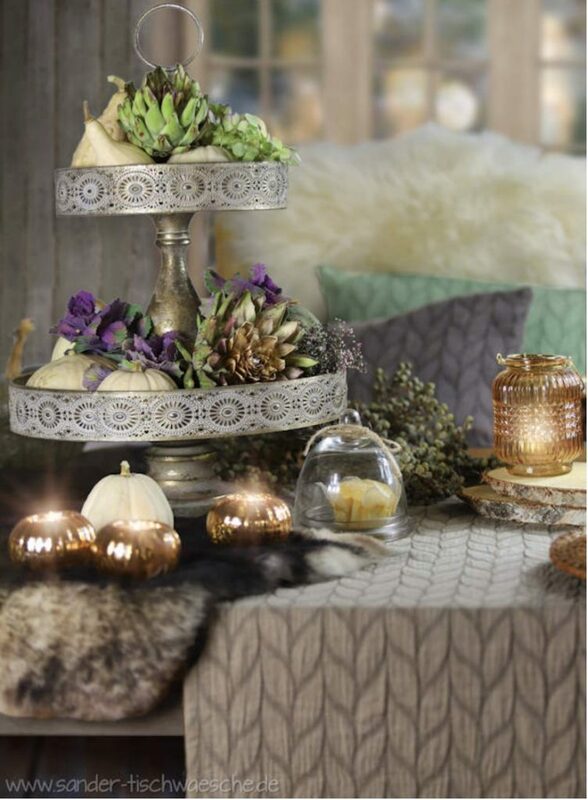 Style a tiered tray that is Fall perfection! At the base, place votive candles surrounding the tray. A great Fall display that can carry you beyond the Halloween season and into Thanksgiving. 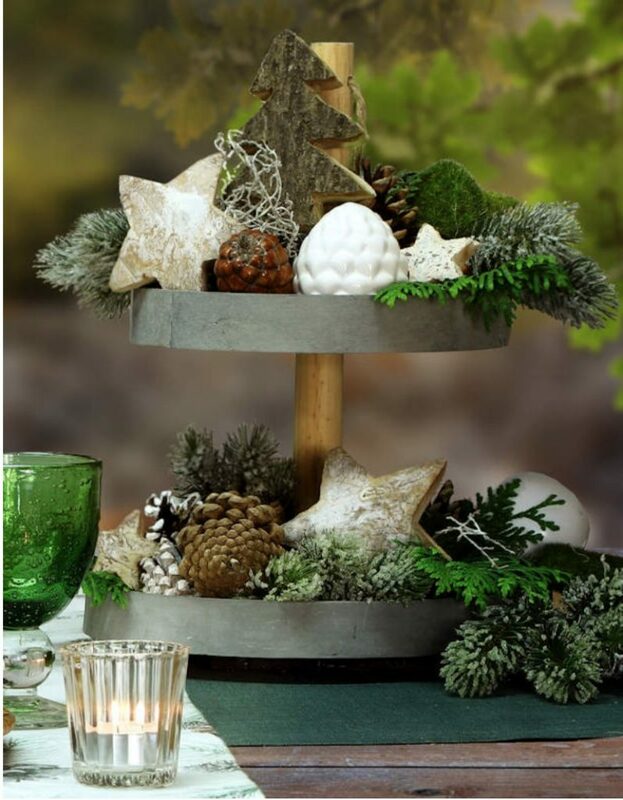 This two tiered tray by Sander-Tischwaesche features lots of Christmas greenery. The trays are lined with various types of evergreens. Tuck a few pine cones in the trays. Some pine cones are covered in snow. Add white powdered stars in various sizes to reflect the light. To light up the stand, simply add a few clear glass votives to continue the look. A quick and easy Christmas forest display that looks fabulous throughout the Winter months. Simple and beautiful! Style a tiered tray to celebrate an event. Collect your items to style the tray. Celebrate a birthday with a special birthday hat, candles, some balloons, and a birthday card or two. Photos are a great addition to a tiered stand as well. Be sure to add a baby picture along with a current photo of the birthday boy or girl. This adds a little nostalgia to the celebration. This Farmhouse tiered tray is featured by Linda at Life on Summerhill. For some Halloween fun, style a tiered tray with pumpkins. Add some spooky characters such as bats, spiders, or even ghosts. Throw in a little candy such as the candy corn we all love. 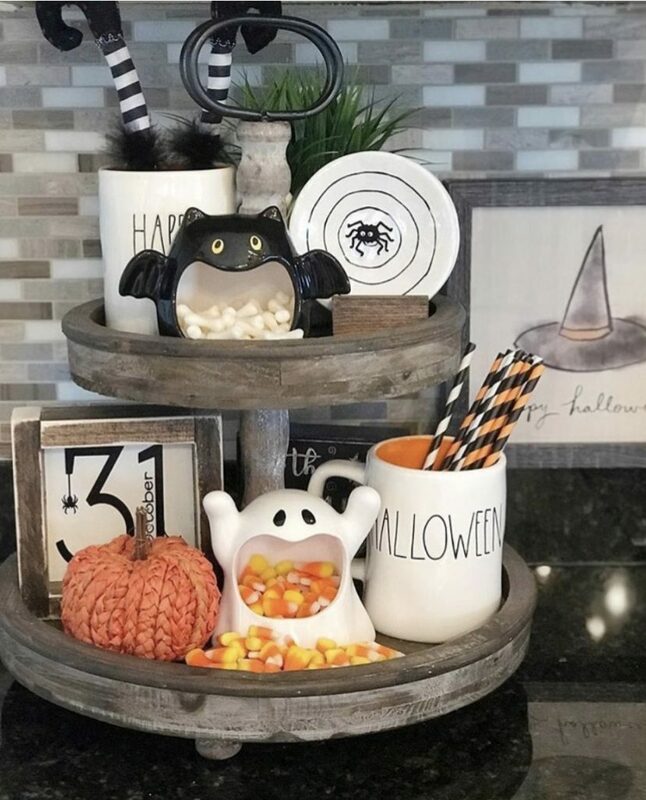 This tiered tray is the perfect balance of treats, tricks, and spookiness. The two tiered black handled tray is perfectly styled with its orange, black, white, and a tad of yellow colors. Seems as if a witch took a wrong turn and landed in the cup of coco! Style a tiered tray to add some Christmas cheer to your home. Add some blue and white votive candles. Add a few Christmas tree ornaments in various sizes and shades of blues and whites. Tuck evergreens between the ornaments. 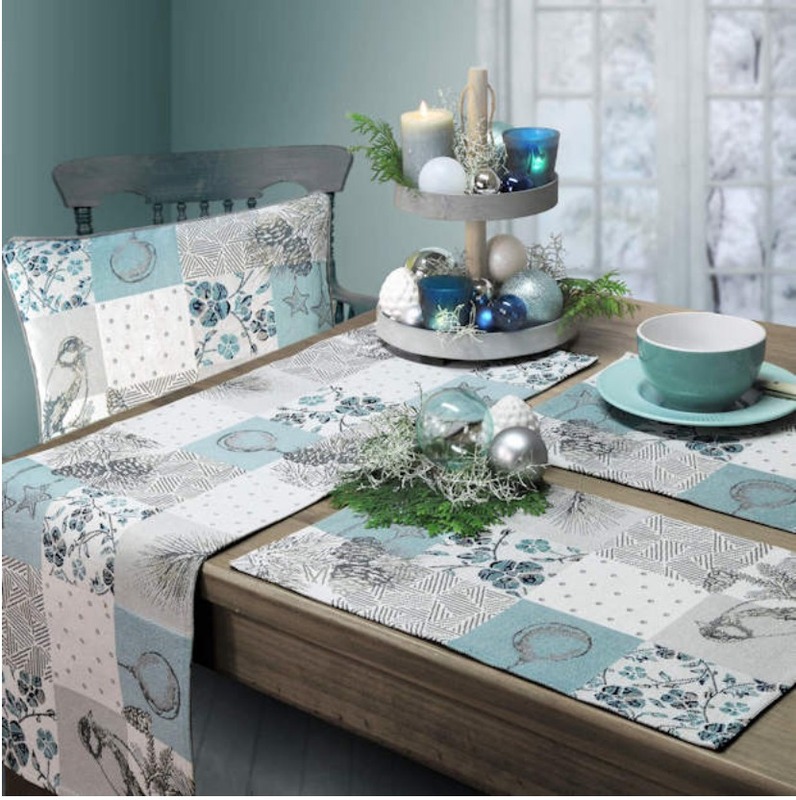 Beautiful silvers, grays, and shades of blues for the Christmas season. A quick, easy, and affordable Christmas season decor. Collect your items to style a tiered tray. Consider the following as you gather those items to include in your tiered tray stand. Include a light source such as a votive or candle tin with cover. You can also use a small lantern to brighten the tiered stand area. Think about your background area. A mirrored background will reflect light and adds depth to the area. Your themed decor items should be in varying sizes and heights. 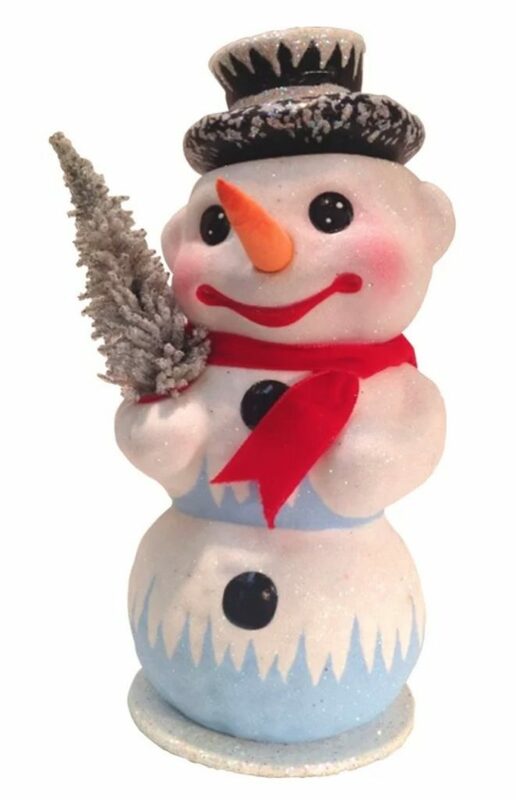 For instance, a snowman theme can include snowmen in a variety of sizes. Add a collect of accessories used by snowmen. 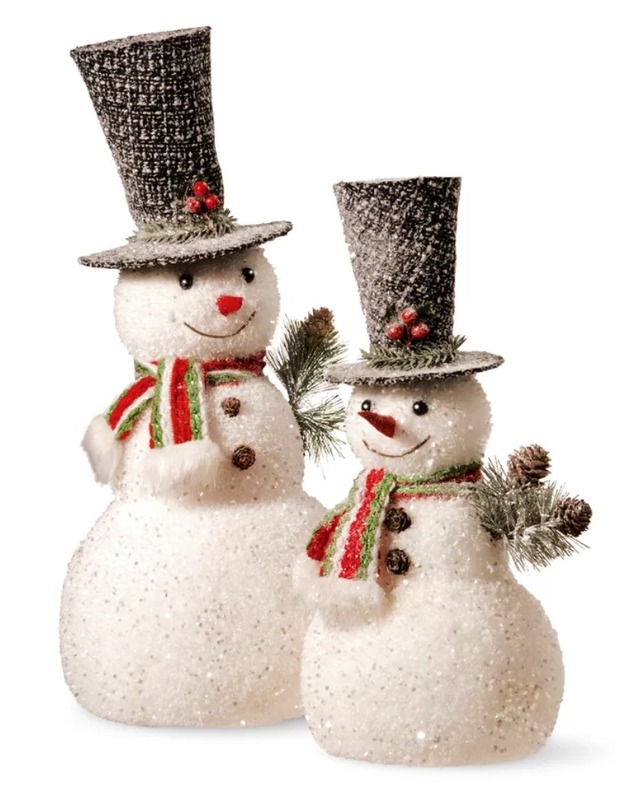 Snowmen accessories such as top hats, brooms, scarfs, or what you have handy. Other accessories you can include are Christmas trees or sleds. A lamp post or even a clock post makes for a great accessory. Always use an odd number of items. Odd numbers such 3, 5, 7, or 9. Consider your color selections as well. You can use white, black, and red as primary colors for a snowmen theme tiered tray. Use a variety of textures. Textures such as wood for Christmas trees, snow for the Snowmen. Black felt for the top hat. A snowman or snowmen style a tiered tray is the perfect kid-friendly home decor activity. Crank up the Christmas music. Serve some hot coco along with some Christmas cookies while the kids decorate the tiered tray. A decor warm up leading to decorating the Great Christmas tree. Don’t forget to take a few photos for next year’s Christmas decorations. Style a tiered stand with what you have at home. Select a theme for the tiered tray. Gather the main items. Use small kitchen bowls or pitchers that can act as filler. Use greenery or evergreens you have in your yard or garden. By using items you have on hand, you can style the tiered tray without spending any money. Other items that can be used are family mementos or old family photos. This is especially a treat during family gatherings. Personalizing the tiered tray makes for a great look during holidays. Budget friendly and kid friendly decorating to add instant style to your home decor. A perfect solution for busy moms. Tiered trays can be changed as often as the seasons change. They are portable. Many come with handles at the top. Handles provide ease in transporting from one room to another. Use these decorative stands in the kitchen, dining room, bathroom, on a porch or deck. Tiered trays can take you from holiday to holiday by simply adding a few holiday decor pieces. An important accessory that is not only gorgeous but small space friendly! I especially like a personalized styled tiered tray. Adding photos of children, pets, your spouse, and family makes for a warm, cozy setting. A great way to remind our children the importance of family. If you have any DIY style a tiered tray ideas, please consider sharing them with us. And if you try any of these ideas, let us know how you make out in the comments below!